(TibetanReview.net, Jan15’19) – China has come up with another bright idea to ‘prove’ that Tibet was historically part of it: plans to erect a group of statues of its officials deployed “to administer” the region from as far back as 1727 during the time of the seventh Dalai Lama. Tibetans are currently already required to put up framed pictures depicting Mao Zedong, Deng Xiaoping, Jiang Zemin, Hu Jintao and Xi Jinping in their homes as well as at religious and other public places. During the tumultuous period around 1727, when internal conflicts and armed interventions by Mongol chiefs and the Qing emperor dominated the political landscape of Tibet, China began the practice of appointing resident commissioners (ambans) at Lhasa. The first amban appointed in 1727 was, however, not Chinese but a Khalka Mongol while a Tibetan named Khangchenney headed the government. The 7th Dalai Lama remained the symbolic head of state with support from the Qing emperor in the latter’s capacity as the religious patron of the former. 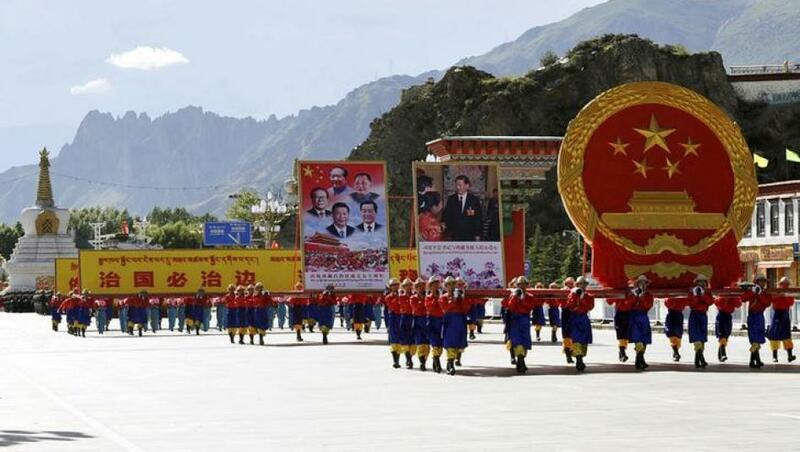 During the second meeting of the 11th Tibet Regional Committee of the Chinese People’s Political Consultative Conference, members submitted 405 proposals that included those to protect the region’s traditional culture, using methods including building statues of officials deployed to be stationed in Tibet throughout history and protecting the Tibetan language, reported the official globaltimes.cn Jan 14. The report said the proposals on cultural development included building a group of statues of officials “deployed by the central government throughout history”, or a relief sculpture of them in Lhasa. The report maintained that “the central government” started to deploy officials to Tibet in 1727 during the Qing Dynasty (1644-1911) “to administer the region”. The report said other proposals included deepening reform on the management of folk art groups, preserving and developing the Tibetan language, passing down traditional handicrafts and encouraging these handicrafts to help with poverty alleviation work.